Beesfund | INVEST IN INNOVATION! We are a manufacturer of the most technologically advanced gimbals in Europe. With your support, we want to become the world leader in manufacturing image stabilizer devices. On 17th January 2017 we wish to invite you to a meeting with ACR Systems team. You can find us in Business Link National Stadium in Warsaw, entrance number 1 (Entrance GATE no. 1), at 06:30 PM. If you can’t come – connect with us via live stream at our web site. On January 17 2017 we held a meeting with ACR Systems team. Report video of this event is available below in two versions - long and short. We thank all guests for coming and see you at the General Meeting! Due to the large amount of questions we decided to update the page with explanation of the dependence between the companies and the revenue forecast. In case of further ambiguity, as usual, feel free to contact us. We achieved our goal! Thanks to your help, we are ready to expand our wing and to move swiftly to conquer the world's largest film industry. Your support is invaluable and will allow us to immediately scale our production level and release a carefully crafted 3rd generation GIMS technology. Thanks to investment in ACR you will be able to feel together with us some of the biggest Hollywood productions! By investing in ACR Systems SA you will join a community of shareholders of a leading company in camera stabilizers market. Aside that, we have prepared a number of souvenirs especially for you. Participation in General Meeting - Together towards the goal! By purchasing at least 1 share you will receive an invitation to annual General Meeting of Shareholders, where you will have an opportunity to meet other investors. Classy gimbal miniature, 7 centimeters wide, made from high-quality metal. Resembles a premium quality model – The Beast. Working with gimbal, configuring, walking techniques, selecting proper camera movement in space, applying remote control, building a dynamic shot – all this under the supervision of an experienced film crew cameraman. Location: Warsaw, we provide food and refreshments. and equipment (gimbals, cameras, power supply, monitors, lightning, actors). A wide range of accessories allows for versatile use of stabilizer – both while mounted to a car, under a drone, as well as while using a standard handheld. Gimbal is a popular expression for an electronic camera stabilizer. From the technical side, it is a device that controls the operations of three electrical engines that rotate a construction to a desired position, based on data provided by a set of sensors, such as gyroscopes, accelerometers, encoders, and GPS. In practice, gimbal allows for maintaining a perfect horizon, remote control, and an array of other, creative possibilities enclosed within a compact form of a modern equipment. Due to its small dimensions and possibilities, the device allows creative filmmakers to build shots from perspectives never seen before. The easiness in passing the gimbal from hands to hands, as well as in demounting the device from special systems such as Black Arm or Russian Arm, allows for totally new capabilities in building shots. Gimbals and gimbal movement control systems are successfully used by „ground” operators as well as drone operators. We possess enormous knowledge and experience within image stabilizing technology. We understand that each gimbal user looks for a device that will primarily be technologically advanced. Intuitive handling, durability, and attractive appearance, distinctive in comparison to other products, are also an advantage. Our plans, regarding technologies and new products, are set for three following years. It is possible thanks to enormous experience and knowledge acquired throughout the course of your previous activities. Sales team building specialist with numerous years of experience in premium products sales. Closely engaged in stabilizers’ technology based on electronic drivers. Robotics engineer, awarded with Brief 2015 Award – 50 Most Creative Individuals in Business. Experienced financial planner. Effectively combines knowledge in production processes and in managing company’s resources. Programmers, mounting technicians, associates – a strong team is the core of our enterprise. The Investor added us at the early stage of our development by providing smart-money and allowing dynamic development of technologies. Due to help provided by SpeedUp specialists, we were able to build and in detail prepare our business model. Advanced Cinema Robotic Systems Spółka Akcyjna has all that is needed to meet the statutory purpose. Trade marks, mechanics designs, the license to develop and use of the software are owned by Spółka Akcyjna. One of our founders was taking shoots from the air while using unmanned flying vehicles, today commonly referred to as drones. The first prototypes were created in response to a question: how can we acquire stable footage? The ideal was transformed into its physical form thanks to a crowdfunding campaign at Kickstarter (2013). The PLN 1 000 000 acquired this way allowed for manufacturing the first 100 gimbals, and it strengthened our conviction that we are on the right track. The Investor joined us in early 2015. The goal was simple – creating a business model, finishing the technology, and preparing for changing the processes from workshop conditions to professional production. The amount of PLN 1 500 000 was invested into company’s development. This allowed us to achieve the envisaged goal. Our devices are successfully used in various, different film locations, mostly in Germany, France, Great Britain, and in the USA. Many productions that we had the pleasure to see in cinemas have been created with our gimbals. Thanks to the effort of the whole team and an extraordinary help from user communities, the third generation of gimbals has been optimized in regard to limiting production time and costs, easiness of operations, and maintenance. Strong team of professionals that combine experience and knowledge in designing, programming, prototyping, production, advertising, and post-sale services is a guarantee of our success. Another step is utilizing our established position, new technology, and experiences. Thanks to you, we will achieve greater operational readiness and we will be prepared for intensive expansion to foreign markets: USA, India, Europe, Australia. Join us! Our clients can be characterized based on 3 main criteria. Based on a possessed camera (weight), realization type (air shots, car-to-car, ground operator, etc. ), and the team (focus puller, remote director’s, remote control) the selection of a proper devices from our offer is of key importance. Thanks to its variety and the offer being systematically adjusted, we are able to meet the individual needs of our clients. Operators entering the market, local filmmakers, creators of advertising materials and documentary specialists, journalists, amateurs. A lot of unique solutions were created in our R&D division. Real Inverted Mode, applying an embedded keyboard and OLED screen, integrated power supply for cameras and accessories, and a range of other functions were all created thanks to courageous approach towards research and development works. Not without significance was also an enormous help from our testers and brand ambassadors who, while using ACR gimbals on a daily basis, supported us at each step of the design. Correct operating is not enough for our demanding clients. Our devices, being easy in use, at the same time provide the highest level of functionality. Fast and efficient configuration, automatization of update and configuration processes, precision of operating, and new functionalities – thanks to an internal team of programmers we were able to create unique solutions that have already had an opportunity to be tested on difficult filming locations. Our clients accomplish serious projects – we approach our job seriously. Gimbals are manufactured from highest quality materials: carbon fiber, aircraft aluminum, polymers. Components processing is performed on numerically controlled machines, and the production process also includes technical anodizing and corundum covering. Electronics are built based on Cortex family processors and advanced sensors. Almost whole of the production takes place in Poland. Our products are thoroughly controlled before shipping to our clients. We apply strict quality standards and care for positive experiences of our clients, from the very first contact with a gimbal. We guarantee highest quality RMA service, the longest warranty period (2 years) on the market, and post-warranty repairs during the whole product exploitation period. What we spend our resources on? It is a first step towards acquiring money necessary for increasing the scale of an enterprise, and to launch a wide-scale marketing campaign. We have a creative, experienced, and innovative team of people, and proper technology. Currently, we want to focus on building global brand awareness and proper manufacturing infrastructure. Intensified activities aimed at realizing marketing campaign. Increased presence in social media, on professional portals and during branch fair events, and cooperation with brand ambassadors will ensure an increase of our brand recognition. Go Global! We will be able to optimize costs of acquired components, while at the same time scaling the production, in order to acquire highest profitability. We want products from the third generation to be manufactured in a most cost-effective way, without sacrificing the quality. Due to an increase in scale, and for the purpose of speeding up the production, we wish to move to another premise. This will allow our team to have an on-location division of electronic engineers and programmers, which will substantively increase the effectiveness of our work. The third generation of technology is modular and fast-adapting. Enormous experience gathered throughout previous years and the support of testers, clients, and distributors allowed us to prepare product portfolio, while considering the necessity of withdrawing some of the products, and introducing their successors for the following years. Throughout last several years we have been building an advanced technology, while improving the business model. During this period, we have been testing client’s reaction towards innovation. We are currently in a process of extending our offer, as well as increasing its availability on the market. For this purpose, we are strengthening the position of our company, we are tightening the cooperation with our subcontractors, and we are changing our production location. In 2017 we will be developing our presence in the USA and Western Europe, strengthening our position in Poland, and we will be introducing our products in India. Additionally, in the following years we plan to take care of our clients from other countries of North America, South America, Australia, and Africa. After three years, we plan to go public on Warsaw Stock Exchange. Alternatively, we will be considering an option of industry exit. Valuation of our shares is based on prior results and brand value. We have a lot of satisfied users who use our equipment on filming location of the biggest Hollywood productions. We have active distributors in Europe, Australia, and the USA, and other parts of the world are included in our plans. We are certain that the actual value of our company is in accordance with the valuation presented. CAN I REALLY MAKE MONEY ON THIS? We think so. It is worth having a small number of startup shares – when they become big, each share may be worth a couple times more than the initial purchase price. We operate in an industry that is connected with drone market – it is one of the most dynamic film industry branches. While we certainly remember about the scale, we are sure that each share purchased today, within a few years, will be worth a lot more. Yes – according to law, shares may be further sold at own discretion and according to individual price. DOES OWNING SHARES ENTAILS ANY OBLIGATIONS? Owning shares does not entails any obligations. Once a year you will receive an invitation to a General Meeting of Shareholders where your attendance is not mandatory. IS SUCH PRICE IN ACCORDANCE WITH LAW? Yes – we cooperate on this issue with Beesfund.com portal, that is experienced in similar issues, and with a legal office that takes care of all the formal issues. An important information is also that the initiative has been reported to the Financial Supervision Authority. DO YOU PLAN ON PAYING DIVIDENDS? At this moment, no. Our main goal is to build stabilizers of the third generation. Generated profit, as previously, we want to allocate to further investments. HAS ANBYODY EVER ACCOMPLISHED THIS? 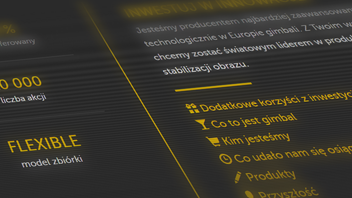 The invest.acr-sys.com is realized with cooperation with Beesfund.com which, as a leader in ownership crowdfunding in Poland, has previously organized a number of similar initiatives. From your point of view, a very important fact is that the organization of this initiative is reported to the Financial Supervision Authority. Please visit www.beesfund.com, and learn how many from Polish projects have already acquired capital thanks to transforming into a joint-stock company and through share issuance. AND WHAT IF YOU DO NOT GATHER NECESSARY FUNDS? We need the funds only to increase the growth of our company. If we do not gather the necessary capital, this plan will still be performed, only at a slower pace. OPPOSED TO THE PREVIOUS FINANCING STAGES IN A FORM OF FUNDS ORIGINATING FROM KICKSTARTER CAMPAIGN AND SPEEDUP INNOVATIONS, WHAT WILL 400 THOUSAND GATHERED THROUGH DONATION ON BEESFUND.COM CHANGE? Previous resources, which we acquired through external financing, allowed us to focus on development and on preparing technologies, and on market analysis, thanks to which we precisely know what, to whom, and in what form we need to provide. Our devices are a combination of advanced technology, precise electronics, and complex algorithms. All this, packed in a casing designed with care for even tiniest details, shows that funds have been utilized properly. Additional 400 thousand will allow for immediate rescaling of the enterprise, and to introduce to the market another hundreds of devices of the highest quality available. Thanks to this current initiative, we will familiarize potential investors with our company. What is the dependence between Spółka z o.o. under which you operate so far and newly established Spółką Akcyjną? Advanced Cinema Robotic Systems S.A. was established to create and deliver solutions for the film industry. We will focus on technology development and fulfilling the needs of creative filmmakers. The main attention will be directed towards the growing interest in unmanned vehicles, so-called drones, practical application of stabilized VR recording, and providing unique stabilization solutions (gimbals) for users around the world. We are a new entity but we continue to develop the work started in ACR Systems Sp. o.o. using gained experience. ACR Systems Sp. o.o. remains active, however, it will not be a competition for the newly established ACR Systems S.A. ACR Systems Sp. o.o. will be focused on service activities. ACR Systems Sp. o.o. today owns 100% of ACR Systems S.A.